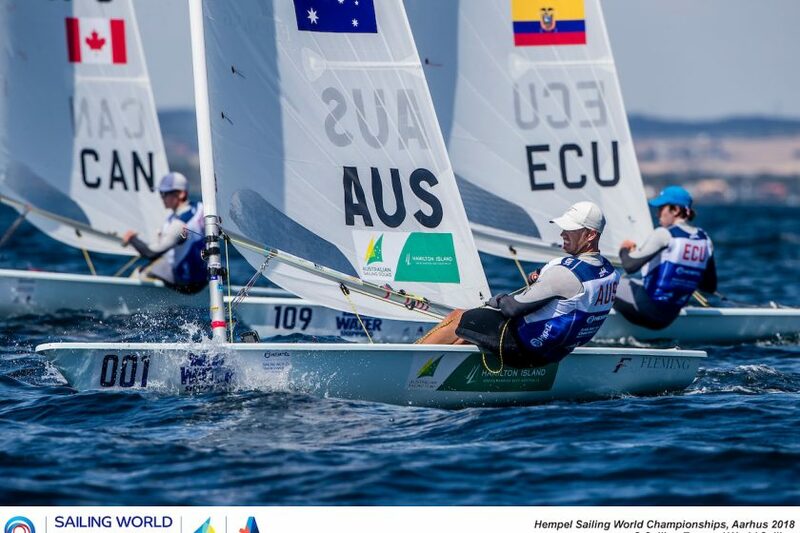 (Aarhus, DENMARK) Two races were completed in the Laser and Laser Radial World Championships in Aarhus, Denmark. The events are being run by World Sailing as part of the Sailing World Championships, a quadrennial event combining the world championships for each of the Olympic classes. 165 Laser Standards are competing in the men’s division, while 119 Laser Radials are sailing in the women’s division. Competition in both divisions is high as these championships are the first opportunity for countries to qualify for berths to the 2020 Tokyo Olympics. In the Laser Standard championship, the top 14 countries represented in the final standing will earn the right to send a sailor to the 2020 Olympics, while the top 18 countries will earn that right in the Laser Radial division. Day one of racing was played out under a bright sunshine, and the absence of clouds aided the earlier arrival of the south to south-easterly sea breeze that built from 8 to 12 knots with gusts of 16. The huge Laser and Laser Radial fleets got underway and it was no surprise to see the Dutch Rio Olympic champion and three-time world champion Marit Bouwmeester near the top of the leaderboard. Although, even Bouwmeester did not have it her own way, with her young compatriot, Maxime Jonker, winning the first race ahead of her. It underlined the strength in depth of the Netherlands program. Vasileia Karachaliou, of Greece and U.S. sailor Paige Raily sit tied on top of the leader board, each with a first and second place finish in their fleets. The pair are followed closely by Norway’s Line Flem Host and Bouwmeester, tied for third place with 5 points each. With 165 entries, the Laser division was split into three fleets. New Zealand 2016 Olympic bronze medallist, Sam Meech, was perfect in his fleet, winning both races on the day. Kaarle Tapper had a superb day of racing with two second place finishes to hold second place overall, which two-time Laser World Champion, Nick Thompson, of Great Britain hold third overall. Perennial top sailor, Philipp Buhl of Germany, who sits in fifth place overall commented on the racing: “The conditions started off light, but the wind developed. There was not much waiting around and I secured two good races – fourth in the first race and third in the second. We had 10 knots during the second race. Racing in both championships continues tomorrow with 2 more qualifying series races scheduled.